Round 10 of the summer series today was held at Holly Farm South Walsham. 20 members turned out for this one. Every peg except one was in. With the weather much warmer than of late it look like being a good day (if you drew the right peg).With everybody ready, it was time to see who had all the fish. 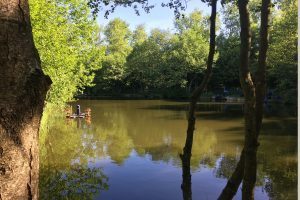 This week saw Mark Harmer climb 2 places from third to first, Mark fished peg 15 on the far side and caught steadily for the first 2 and a half hours with one zoo creature weighing 15lb 4oz then only caught 3 more fish. Mark weighed 43lb 12oz. Well done Mark. 2nd place this week goes to last weeks winner Kevin Lawson. Kevin fished peg 6 and caught fish all day and weighed 37lb 12oz. 3rd this week was Mark Seaman. Mark fished peg 3 and caught for most of the day and weighed 33lb 14oz. (you can’t keep him down for long). Everybody else had some fish but it’s still way short of what it used to fish like. And there were 3D.N.W’s this week. Next week it’s back to Glenn Farm Merton. Don’t forget your bacon roll money. Round 9 today in the summer series was at Melton Pond 4. 14 members made the long drive this week. The weather this week was for rain first then nice sunshine and that’s how it pans out. The sun was definitely shining on this weeks winner. Kevin Lawson was celebrating his birthday and the fish came to the party too. 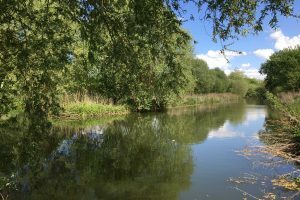 Kevin fished peg 14 on the far side and weighed a very good 118lb dead.That’s what you call a birthday, well done Kevin, even if you did put them back before I had taken a photo! 2nd place this week was Terry Smith. Terry was fishing peg 12 in the far side and caught some nice carp for 39lb 12oz. Well done Terry. 3rd place was Mark Harmer again. Mark fished peg 2 on the car park side and weighed 36lb 8oz. There was 4 D.N.W’s this week but everyone else caught some fish. 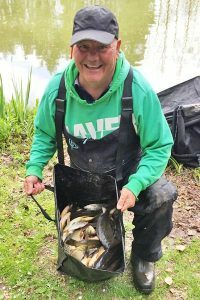 Dave Edgerton done his usual walk round because he couldn’t get a bite and ended with 6. Maybe we should all try his tactics. Next week it’s back to Holly Farm South Walsham. See you all there. Round 8 of the summer series took us to Reepham. This is a new venue on our summer calendar. 20 members turn out for this one, the most so far. With the weather being a little chilly and the match weights a little low from the Saturdays match, every one was a little unsure what it would fish like. Never the less it was time to see who would be on the fish. As it turned out it was Dennis Willis who had all the fish, and ran away with it. 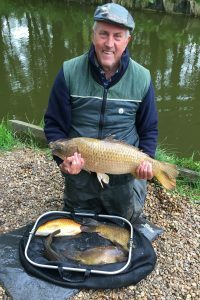 Dennis fished peg 29 and weighed a very good 92lb 2oz for first place. 2nd place goes to Mr Mark Charlwood. Mark fished peg 9 and weighed 61lb 2oz. 3rd place goes to Mark Harmer. Mark drew the flyer (so the owner said) so I guess I messed it up. Mark fished peg 27 and weighed 34lb 6oz. Everybody caught fish but it was not as good as we thought it would be. Roll on the summer. And 3 D.N.W’s this week. Next week is another long drive to Melton ponds, see you all there. Round 7 today was held at Bartles Lodge in Elsing. With the very cold week nobody was sure how it would fish. 13 members made the long trip this week. With the draw done it was the venue expert Alex Watson who won this week. For once Alex was not on peg 4 instead he drew peg 10. Alex had a very slow start but really finished strong and ended up weighing 115lb 6oz. 2nd place was Mike Dossena. Mike caught fish from the of for most of the match but it slowed down in last hour and half. Mike weighed 107lb 4oz from peg 12 unlucky Mike. 3rd was the draw specialist Mark Seaman. Mark fished peg 11 and weighed 78lb 13oz. Well done to them. Overall it fished quite well. Sorry about the photo bomber on the photo. Next week it of to Reepham. See you all there. Only one D.N.W this week. Round 6 of the summer series today was at The Old Stables in North Walsham. 14 members turned up so it was a full house. The weather was a little overcast so hopefully the fish would bite. Once again it was the in-form Mark Seaman who ran away with this one. Mark fished peg 8 on the far side and caught fish from the off all day, and ended weighing 52lb 2oz. Well done Mark again. Can anyone stop him. 2nd place this week goes to Mr Mark Charlwood. Mark dropped down a place this week. Mark fished peg 6 ( his favourite) and weighed 28lb 4oz. Well done Mark. 3rd place goes to Mark Harmer. Mark fished peg 15 and weighed 27lb 4oz. So it was quite close between them but not even close to the winner. As for everybody else it was a reasonable days fishing. 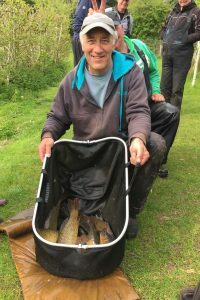 John Hehir caught the biggest fish of the day weighing 13lb plus but unfortunately after that he struggled for bites. Unlucky John. There was 2 D.N.W’s this week. Next week it’s of to the very prolific Bartles Lodge in Elsing. A few tips that might help us mere mortals! Round 5 today was at Holly Farm South Walsham. This venue is not the same as a few years ago but, never the less, 17 members turned out. With a major drop in temperature and rain forecast it was time. 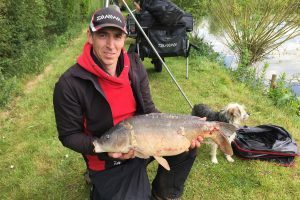 Mark Charlwood came out on top this week from peg 12. Mark caught carp down the edge for a weight of 34lb 8oz well done Mark. That’s his non winning run over. 2nd place this week was Ash Dennington. Ash was making his first outing this summer and he was only 4oz’s sort of Mark. Ash weighed 34lb 4oz from peg 17. 3rd was Dennis Willis also making his first appearance this summer. 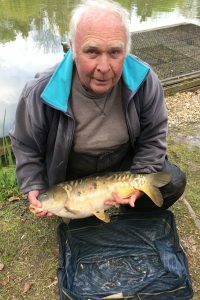 Dennis fished peg 4 and weighed 30lb dead. Well done to them. Everybody else caught fish but it was a struggle. There was 5 D.N.W’s this week but they all caught fish. Next week it’s back to the Stables in North Walsham. See you all there. No photo this week. The winner was camera shy! Cobbleacre was the venue for round 4 this week. 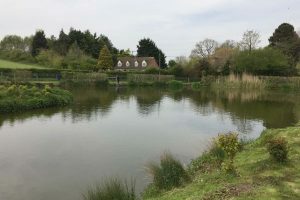 With the fishery having problems with the normal match lake we had to fish the road side lake. 12 members turned up and hoped it would be their week. With a very hot day forecast it was time to see who would come out on top. 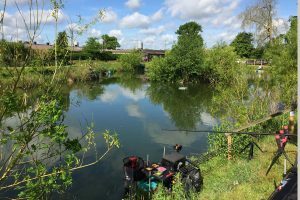 Taking top spot this was Mark Seaman, Mark fished peg 8 and had a slow start but caught steadily through the middle of the match to weigh 20lb dead. Well done Mark. 2nd place was Tony Wilkinson. 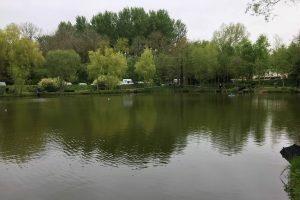 Tony fished peg 11 on the far side and caught carp and silvers for 14lb 4oz. Well done Tony. 3rd this week goes to Mark Harmer. 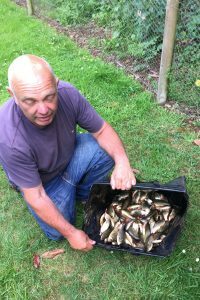 Mark fished peg 5 and weighed 11lb 12oz of Carp and silvers. Well done Mark. There was just one D.N.W. this week. It was a very hard day for most but at least the weather was warm. We all thought Metton was hard! Next week it’s Holly Farm South Walsham. See you all there. Round 3 this week took us to Glen Farm Metton. Another good turn out this week with 14 members lining up at the draw bag. With everyone ready and the bacon roll ordered it was time to see who would be the lucky one this week. Mike Dossena drew peg 6 and caught midway through the match to finish first with a weight of 20lb dead. 2nd place was Mark Harmer who drew peg 8 which is a good peg but I fluffed my lines with 4 lost carp early in the match so only weighed 12lb 12oz. Mr Mark Seaman came in 3rd with 9lb 9oz. It was a real struggle for everybody else. The other 5 members didn’t weigh. Next week we travel to Cobbleacre so it’s going to be another hard week but you never know. See you all there.